A reflection by Fr. Idara Otu, MSP, for the Twenty-sixth Sunday in Ordinary Time. First reading: Amos 6.1, 4–7. Second reading: 1 Timothy 6.11–16. Gospel: Luke 16.19–31. 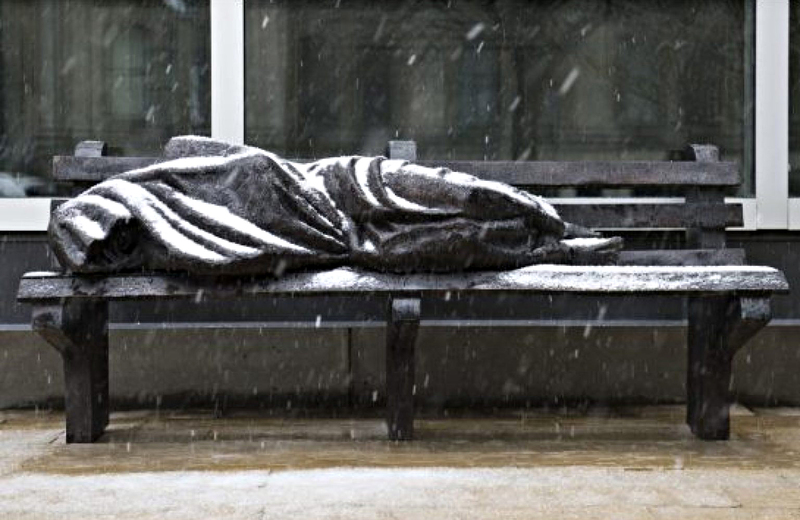 Near the front door of Regis College, the Jesuit School of Theology at the University of Toronto, is the statue of the Homeless Jesus by artist Timothy Schmalz. The statue depicts Jesus lying on a bench with wounds in his feet and partly covered by a thin blanket. Going through the Regis College main entrance on Wellesley Street, one cannot miss this inspiring masterpiece. 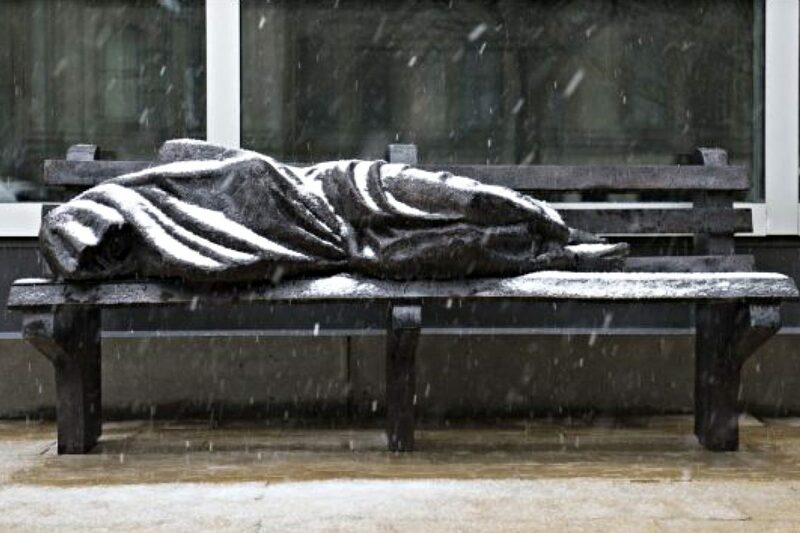 The Homeless Jesus is another symbol of the homeless poor who are in our midst and their presence is undeniable. But it is possible not to recognize in this sculpture the person of Jesus, just as we can fail to recognize Christ in the face of the poor, or even to recognize the poor as fellow human beings. With deficits of equal opportunity in the world, one does not need to look far to see the gap between the haves and have-nots. The suffering poor are all around us and yet we are often indifferent to their plight and often to their very existence. The parable of the rich man and Lazarus speak to the consequences of ignoring the poor in our midst. Indifference blinds the heart from seeing the needs of others. Indifference paralyzes one from moving beyond self to the other. The rich man feasted every day, yet he was indifferent to a starving Lazarus sitting at his gate. The rich man could not care less. In the afterlife, the rich man recognizes Lazarus in the bosom of Abraham. One wonders, how could the rich man have missed Lazarus sitting at his gate? This is the tragedy of indifference. Indifference blinds the heart from seeing the needs of others. Indifference paralyzes one from moving beyond self to the other. In this parable, Jesus teaches that material possessions are not meant to possess one’s life to the extent that we become deaf to the cries of the poor. Neither are we to be preoccupied with self to the extent that we become blindfolded to the sufferings of others. Being rich is not a sentence to Hades; neither is being poor a free pass to Heaven. How one lives in times of poverty and riches makes the difference. Wealth should not be a means of segregation, but rather a means of inclusion. The poor live in the midst of riches that are beyond their reach. The just distribution of wealth serves to create opportunities for the poor. Our Christian responsibility is to reach out to the poor beyond their poverty. The poor are our brothers and sisters and we are bound to them by love. Christians cannot afford to be indifferent towards the poor. As it was for the rich man, our prize for being indifferent is expensive. It is an irreversible chasm between us and God, a chasm that we create. Fr. Idara Otu is a member of the Missionary Society of St. Paul of Nigeria. He is currently residing with the Scarboro Missions community in Scarborough, Ontario, while studying for his doctorate in theology at Regis College in Toronto.